 I am humbled that, Witte’s World, has been nominated for the Blogger Recognition Award! 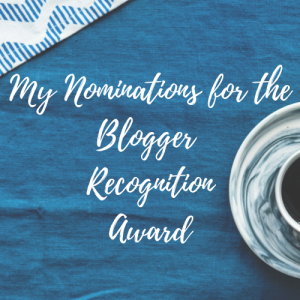 My friend Tammy Staley from Mid-Life Milestones has nominated me and it means a lot that my blog is being read and appreciated, especially by someone as awesome as Tammy! 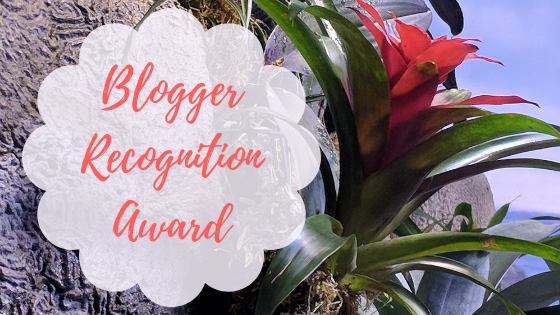 The award is a way that we recognize and support each other as bloggers, and especially to show that we appreciate how much time, work, energy, and effort goes into producing and maintaining a high-quality blog — it’s a lot to do, but the love we get in return (from our readers, as well as, each other) is pretty darn amazing! Well, it is a very long story, but the short version is, we started our blogging journey because we love writing, traveling and eating! In 2016, I (Linda) retired from teaching and was searching for something to keep her busy during the long, lonely days while Fred kept working a few more years. I read about a possibility of being able to travel and eat for free by writing about my experiences. We decided that blogging would be a great adventure and a great plan for our retirement years. After completing a few courses, creating a website and working hard, we still have not been able to make any money with our blog…but we are continuing and are determined to make this into a money making business! I just have to remember it is a marathon and not a sprint! 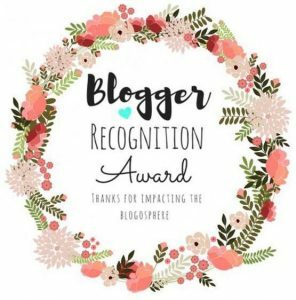 The Blogger Recognition Award proves that I am on my way to having a successful, money-making blog. Just recently I created a business plan, rebuilt my blog, created a content calendar, and have been working to gain more views and build my following on social media. I am very proud of my Facebook Group, For the Love of Blogging! I this group I help new bloggers learn about social media and blogging. I am currently in the process of creating two courses on How to Start a Blog the Right Way and Everything Bloggers Need to Know About Social Media (Well Almost). 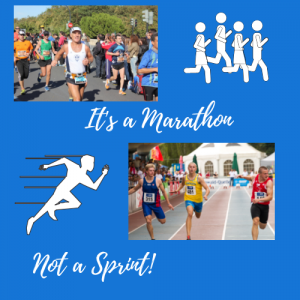 Blogging is a marathon, not a sprint! Like a marathon, you need to prepare yourself to be successful. If you plan on monetizing your blog you will need to start with a business plan (Freebie coming soon!). The business plan will help you stay on track, help you maintain a budget, teach you the basics of blogging and the elements that go into a successful blog. Think of your business plan as the preparation before the race. If you don’t prepare your body for the race, it will break down, if you don’t prepare to start a blog, you will become frustrated and quit. Take your time and prepare a plan, if you do, you will succeed and finish the race a winner! While preparing for a marathon you will want to join other marathoners to create a supportive community who will help you to finish the race. In blogging, the same is true, you will want to find a blogging community to join. In this community, you will find the support you need to get you through those long days of confusion, doubt, and frustration. Most importantly, you will need to connect with other bloggers on all social media! You will spend a lot of time on social media trying to build your followers and get subscribers/viewers on your blog. Your community of blogger friends will help spread the word you exist. Be nice, be supportive, follow social media etiquette and stay positive. If you find a great set of blogger friends (like I have) they will help you succeed in ways you couldn’t imagine! Google will become your best friend! Google searches are a must when you are starting your blog! You will be using youtube videos daily to learn how to add this or that to your website. Google will become your best friend! Not only do you need Google to search for the HOW TO’s of blogging, but you need Google to get them to optimize your website for searches. You will want to get Google Analytics on your site and one of your first affiliates might be Google AdSense. Ashley Rainsbarger is an amazing coach and helps everyone on her blog, The Wiser Life, with her positive words and ideas! Edel Pace is an amazing blogger who shares her passions at Pacemaker Blog. I love her motto, “Start by Doing”! Dan Swords has and his blog, Dan Swords, been a tremendous help to me as a blogger! Not only has he hosted me on a Featured Friday Post, but his guides to blogging have helped me become a successful blogger myself. Lauren M has only been blogging for a few months, but has been an amazing support to me on social media! Her blog, Bustin Out Beauty, will provide you with all the latest trends in fashion and life. Marianne Blackham is another wonderfully supportive blogger! Her blog, Luxury Wanderlust with Me, is a luxury travel blog, Marianne has some of the most amazing photos to share from all over the world. Amanda Davis over at Travelaffari is a lifestyle diet blog that has lots of great information from a health point of view. Jennifer Carfora at Failure to Thrive No More writes about her life of staying healthy, being the wife of a military man, and her sons. One of her sons has a rare syndrome called DYRK1A. Sandy Kissel at Sunkissed Memories is a very supportive blogger that writes about travel, recipes, and life. She has some pretty tasty recipes! Lana Pummill is an inspirational blogger at, Finding Inspiration in the Chaos, who has inspired me to keep going, even when I wanted to stop. Lysa Humildad has been a constant motivation in my blogging since almost the beginning! When my blog grows up, I want it to be just like, Sagebrush Farms NV. Lysa blogs about her life in Nevada. Her recipes are delicious, her travels are fun, and her life is pretty amazing! Rigel Celeste has taught me so much about writing a blog. She has so much great information about writing for success on her blog Rigel Celeste. Jennifer Caffelle at, Simply Living, has a heart of gold and loves to share her educational knowledge on her blog. He son is so cute! She has some pretty amazing ideas about educating a toddler. Sarah (Insecure Housewife) claims to be an insecure person, but her blog tells a different story! The declutter section of her blog has helped me to get more organized in my own life, and you HAVE to try her Pumpkin Muffins…they are amazing! Joy (Saving Joyfully) has the most amazing budgeting blog on the internet! If you need any money advice she is your person. Not only does she help with your budgeting, but she is a supportive blogger sho loves to collaborate! 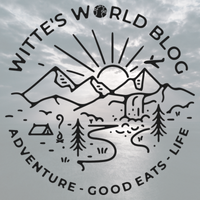 Please subscribe to our website at Witte’s World and follow our journey of traveling, finding awesome local places to eat, and our crazy life! I have been slammed the last little bit and been catching up on some reading of blogs. Wow, thank you! I don’t know if I can go through blogs to pick my faves but I will for sure mention this and your blog in my blog in a few days. Thank you! Let me know when you have the post written so I can read it! Thanks for the shoutout on your blog! Congratulations on this award, it is well deserved. Thank you for the nomination! Also, thank you for your kind words, I’m so glad that my blog has had an impact on your life. That is some great advice for new bloggers. Thank you and I am so glad I met you in social media! Congratulations on your nomination. I am looking forward to being nominated someday. Also, your tips on how you got started and how you are doing on this journey is a great encouragement to us, upcoming bloggers. Your Facebook group, “For the Love of Blogging has been a great tool in growing my blog. Thanks for being so valuable. Thank you Omede! I love to help in any way I can…blogging is difficult! You will be nominated soon, I am sure of it! Thank you so much for nominating me, it is such an honor!!! I will hopefully be posting my recognition reward soon, I’m working on a couple collaborations and studying for class. Thank you for all of the kind words and being awesome! You are so welcome! I can’t wait to see who you nominate. Congratulations on your nomination! You are well deserving of such an award!!! Congratulations Linda! What an exciting award especially in the blogging world where acknowledgement is rare. Bravo! Yes, blogging is hard and if you don’t pat yourself on the back for the little wins, you won’t get much recognition. You are an amazing blogger and your time will come to be nominated too. I am truly honored that you have thought to include me with this list of amazing bloggers! You are welcome! I am honored to have you as a blogger friend and supporter! Wow, Linda, first of all, CONGRATULATIONS!!!! Secondly, whaat? – your kind words about me and Sagebrush FarmNV blow my mind! I don’t really even know what to say, except THANK YOU! You are right when you say this is incredibly humbling! Thanks again dear friend! You deserve this!!! You are more than welcome! I love your site and all the help you have given me the past few months!